Yes, Maryland Matters is raising money along side of their good friends at KO Public Affairs. For those of you who haven’t been paying attention, KO Public Affairs is a Democratic lobbying firm linked with former Governor Martin O’Malley. They’re politically connected, making tons during the O’Malley era thanks to their political connections and old-school Democratic cronyism. This is a topic that’s been covered extensively both here and in the Baltimore Sun. KO Public Affairs also dabbled in “journalism” as the creators of Center Maryland, which they described as “The news you need, straight down the middle.” This is something that Red Maryland was raising alarm bells about nearly a decade ago. They KO’d their credibility pretty quickly and eventually started mixing their reporting with their lobbying as they did during the 2012 Special Session. Needless to say, this brings us full circle to our concerns that we raised regarding Maryland Matters two years ago when the project was announced. I raised concerns regarding the left-wing makeup of the Maryland Matters steering committee at the time, though Josh Kurtz responded to me saying that partisanship was not the case and offered me a spot on the Steering Committee (which I declined). One of the other Maryland news sites, Maryland Reporter, is also a non-profit and independent organization. They also have listed their funding sources on their website and have not raised funds with obviously partisan organizations. So yes, there is a way to maintain financial independence and a continued nonpartisan streak. Now as we have said time and time again, we don’t particularly care if Maryland Matters has a bias. We have an obvious bias toward conservatives and conservative principles. But we also make that obvious for all to see. We don’t claim to be”Nonpartisan” or “Independent”. And that’s a big, big difference. We’ll be reaching out to Josh Kurtz, editor of Maryland Matters, for a comment. We will be happy to update with a reaction. “When we were looking for a venue for a Baltimore fundraiser, we asked a few businesses in the city if they would be willing to host. KO Public Affairs was the first to say yes, and we are grateful that they did. If you are suggesting that there is something nefarious going on — other than the fact that I used to write a column for Center Maryland, which is associated with KO — then you are way off-base. 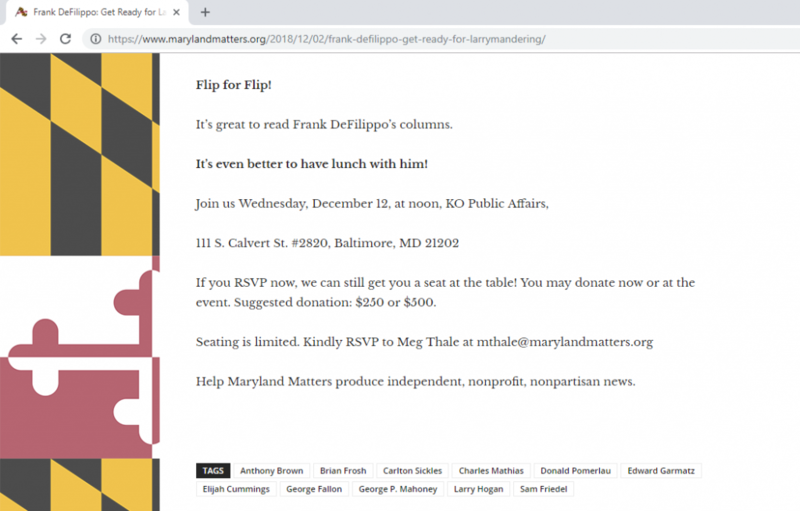 “Furthermore, we have publicized our fundraiser in a few different ways, including in Frank DeFilippo’s column last week. You are implying that we are trying to bury the information in some sneaky fashion. Believe me, we are not.